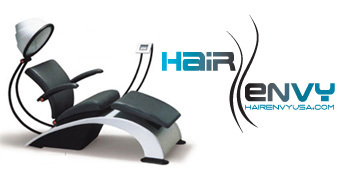 Hair Envy's technology is a patented technology that has been available throughout the world for a number of years and now is available in the United States only through Hair Envy, LLC. In 2007 Americans spent over 1.5 billion dollars on hair transplants and billions more on medical pharmaceuticals. The simplicity of these numbers show one thing, Americans want a full thick head of hair! Until recently Americans have had few choices that produce satisfactory results. Hair Envy is about to change everything that you know about thinning hair. 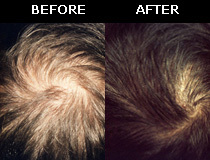 This technology has been proven to be effective in giving thousands of people back the appearance of a full and healthy head of hair! How will I know if Hair Envy’s technology will work for me? In order to ensure that Hair Envy’s technology is appropriate to your specific situation, your salon will ask you to complete a short questionnaire. Because there are many possible reasons for the appearance of thinning hair, questions regarding your hair appearance and goals will be asked. Results of the questionnaire will be reviewed with you. If you are a suitable candidate, a schedule will be recommended and costs will be discussed. What do the sessions involve? During each session, you will recline on a comfortable ergonomically designed chair with a semi-spherical hood. This hood contains electrodes that deliver specified pulsed electrostatic energy during uniquely scheduled sessions. The sessions last approximately 15 minutes and are generally scheduled to occur once weekly. What about safety and side effects? In all cases, the technology is shown to be safe with no known side effects. For clients seeking long-term satisfaction, our experience has shown that ongoing sessions are required to maintain the appearance of fuller healthier looking hair. Weekly sessions are usually recommended. Results will vary from person to person depending on a number of factors. Experience has shown that many individuals notice improvement as early as four to six weeks. However, it can be quite common for individuals to require a longer period before they notice improvement. Does Hair Envy’s technology work for everyone? The best results are achieved with clients who have just begun to notice that their hair appears to be thinning and not as full and healthy appearing as it once was. However, many people of all ages, male and female, have benefited from regular sessions.